Building Information Modeling services : What is the efficient BIM/VDC process? What is the efficient BIM/VDC process? For the majority of Trade contractors, Vendors, Specialty Contractors, Subcontractors, BIM has become a mental state of, "we have some models, and we might even use them". Furthermore what the industry of building structures needs is Virtual Design and Construction, the mental state where the models are the design, the plan, the virtual fabrication that will be created. But in fact there are still existing flaws. The model isn't 100% accurate, the software doesn't do exactly what you want, and there isn't a good way to account for construction tolerances. Despite that even with these drawbacks, the models are significantly better than the paper these skeptics are relying on. It is time to move forward, and here is how a Trade Contractor gets started. What can you see? “It costs me more to get a model created!" If you do by this process, there will have some issues. 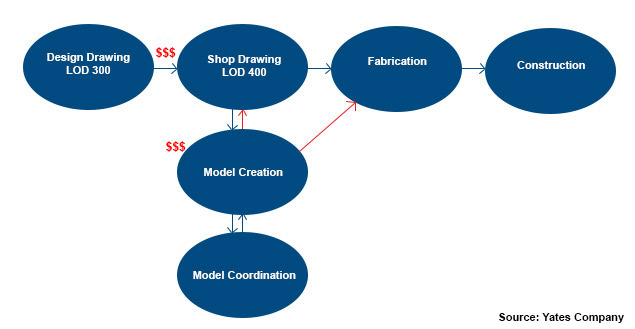 When the shop drawings are separate from the model, there is extra cost for model creation, the model coordination changes don't get back to shops, and the model becomes outdates and useless. Therefore this work flow costs more, take longer, and fails. Do it the right way! The person creating the shop drawing, coordination drawing, fabrication document, etc… should be creating it via the model. This way you only pay once, and if the person is good, you pay less, because it is actually faster and better to create the shops via the model. Start modeling for coordination, since this is what the specifications are going to be asking for. Then as you get good at LOD 350 modeling and your see the benefits of the enhanced coordination, you can move on to more and more LOD 400. "How does this extra work save me money?" As long as it is viewed as extra work, it will not save money. The contract and specifications require coordination, you are just doing it Virtually (via the model) so that if something goes wrong you fix it with a mouse and keyboard. This is a risk reduction, but you have to be using the drawings Produced by a Coordinated Model for it to work. 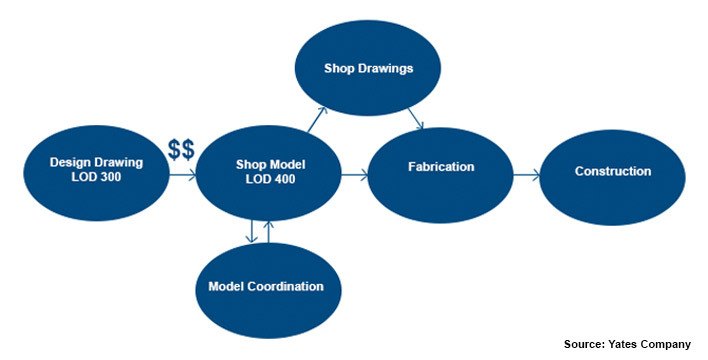 Now the real savings starts to come into play when you model elements for Fabrication (LOD 400), now you get bill of materials, assembly diagrams, and visualization that reduces physical labor time. It also open the door to more and better prefabrication. We are talking about cutting labor time 10 to 50%. There is no way you can cut labor time by 50%, people won't work any faster! It is being done by your competitors and others, and you are right, people are not moving faster. The workers on your team get to move smarter. They spend more time actually installing. Now there are some tools help to cut labor time about 30 – 50%. That means that more than half of your workers time is spent figuring out what to do, where to do it, or how to get it done, NOT actually working. This is what VDC is going to fix. Virtual Design and Construction is streamlining the tradition construction workforce and allowing them to be the skilled craft workforce that they want and we all want. It is removing the hurdles and barriers that get in the way of doing a great job. The hard part of it all is the change. It requires more up front, (Coordination, Modeling, Computer skills) in order to save effort later (Field coordination, moving work, arguing about who gets the space). VDC offers a better way to build, especially for the trade contractor who embraces the process.